Genuine BMW boot or bonnet badge. 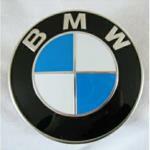 This badge fits the boot or bonnet on many different models of BMW too numerous to list. If you are still not sure, contact us with the last 7 digits of your VIN/chassis number so we can confirm that it is correct for your car. 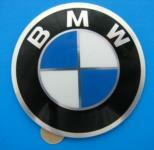 Genuine BMW badge for the boot of E65, E66, E67, E31, E53 and Z3 (Z3 models made up to April 1999). This badge also fits Z3 sides grilles. Genuine BMW self adhesive wheel badge measuring 45mm in diameter. This badge has a curved profile. Genuine BMW self adhesive curved wheel badge measuring 58mm in diameter. This badge has a curved profile. Genuine BMW self adhesive flat wheel badge measuring 58mm in diameter. This badge has a flat profile. Genuine BMW self adhesive flat wheel badge measuring 60mm in diameter. This badge has a flat profile. Genuine BMW self adhesive curved wheel badge measuring 64.5mm in diameter. This badge has a curved profile. 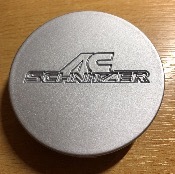 Genuine BMW aluminium self adhesive curved wheel badge measuring 70mm in diameter. This badge has a curved profile. Genuine BMW self adhesive "5" badge. This self adhesive badge is the flat profile type for use with the old style M boot badge. Genuine BMW self adhesive "3" badge. This self adhesive badge is for use with the current style curved profile M boot badge. Genuine BMW self adhesive "3" badge. This self adhesive badge has a flat profile and is intended for use with the old style M boot badge. Genuine BMW self adhesive M boot badge. This badge is the early style of badge with a flat profile. Genuine BMW self adhesive M5 boot badge. This badge is the late style of badge with a curved profile. Genuine BMW M grille badge to fit BMW E30 models that have the cut outs in the grille for this badge. This badge is the early style of badge with a flat profile.